The file extension contains a lot of important information for machines (by which we mean computer software as well as system and hardware platforms supporting them). This is the information about what type of data is encoded in a file with the specific extension. For example: Extensions *.COM, *.BAT or *.EXE inform Windows system in a computer that it contains commands that are to be performed (these are executable files). In Linux-based systems a similar message will be presented by the extension *.SH. 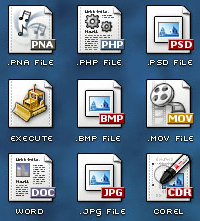 In addition to the executable files, in computer systems there are a number of file extensions that explicitly tell the system what software should be used to support them. These files are generally divided into several categories among which the most important are: text files, graphic files, audio files, and files containing multimedia data. Enter the source format, output format or fill in both fields. We will display a list of possible conversions or a list of applications to perform file conversion. By default in all Windows systems the file extensions are OFF . To see the extension of all the files, you should follow the instructions below. In the Windows Explorer window, select the "Organize" (in older versions of Windows, select the "Tools" ). Select "Folder and Search Options" .